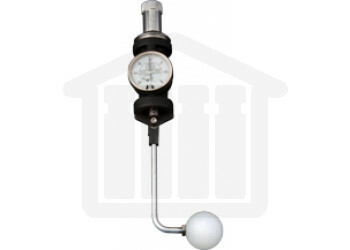 Vessel Centering Gauge for ASTM and USP Validation. Vessel Centering Gauge. Please state bath model when ordering to ensure compatibility. Easy to read centering on dial gauge inside the vessel in the recommended position. Ensure your vessels are perfectly centered! Accurate centering is an essential part of dissolution equipment validation. Many centering devices do not accurately take into account the actual position of the shaft in the vessel, or the vessel in the base plate. The QLA Centering Gauge fits directly into the shaft drive. The PTFE coated lever is lowered into the vessel, approximately half way down. (It is important not to measure centering near the top of a vessel because of errors in the glass at this point). The shaft is rotated slowly (25rpm) and the lever moves around the inside of the vessel. Deviation from the centre position can then be read on the dial, which always faces forwards. Acceptable values are ±2mm from the centre point. Full instructions for both installation and operation are included.